Yukari wants nothing more than to make her parents happy by studying hard and getting into a good college. 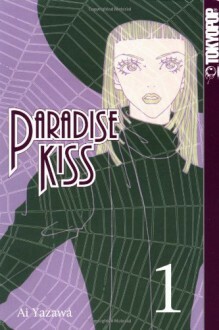 One afternoon, however, she is kidnapped by a group of self-proclaimed fashion mavens calling themselves "Paradise Kiss." Yukari suddenly finds herself in the roller coaster life of the fashion world, guided by George, art-snob extraordinaire. In a glamorous makeover of body, mind and soul, she is turned from a hapless bookworm into her friends’ own exclusive clothing model. Paradise Kiss is one of my favorite manga series. It has a great romance and I love Ai Yazawa's artistic style.